In the period immediately following the end of the Cold War, during the Herbert Walker Bush administration, reduced resource flows to Africa signaled a disengagement from African affairs (Cason 1997). During the William Jefferson Clinton administration, however, both the president and Congress promised greater attention to Africa and by the end of Clinton’s second term development assistance levels stopped falling and the groundbreaking African Growth and Opportunity Act (AGOA) was passed. 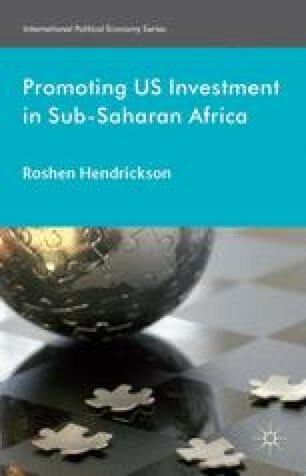 For many scholars of Africa policy the AGOA signaled a shift ‘from aid to trade’, but the neoliberal shift in development assistance during this period was a continuation of previous trends that were gradual and systematic. New policies and adjustments in existing institutions further institutionalized trends in political economy that developed during the Cold War and came to dominate US relations with Africa after it ended. These included close cooperation with international financial institutions in their mission to carry out structural adjustment programs, privatization of development assistance, the expansion of efforts to promote economic relations with Africa, and the effort to channel greater resources through investment funds in the Overseas Private Investment Corporation (OPIC).